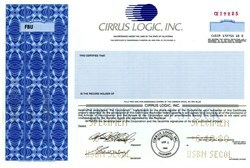 Beautifully engraved specimen certificate from the Cirrus Logic, Inc. printed in 1989. This historic document was printed by the Security Columbian Banknote Company and has a block border with a vignette of the company's logo. This item has the printed signatures of the Company's officers. Cirrus Logic Inc. is a fabless semiconductor supplier that specializes in analog, mixed-signal, and audio DSP integrated circuits (ICs). As of 2015 Cirrus Logic has its headquarters in Austin, Texas. The company's audio processors and audio converters feature in many professional audio and consumer entertainment products, including smartphones, tablets, portable media players, automotive entertainment systems, home-theater receivers, televisions and docking stations. Cirrus Logic's analog mixed-signal converter chips are also used in a wide variety of energy-related applications, including its new line of LED controllers for the incandescent light-bulb replacement market, as well as energy-measurement chips for applications such as digital utility meters. Dr. Suhas Patil founded the company as "Patil Systems, Inc." in Salt Lake City in 1981; it adopted the name "Cirrus Logic" when it moved to Silicon Valley in 1984. Cirrus Logic has more than 1,000 patents and more than 600 products serving more than 2,500 end-customers globally.